As Americans’ life expectancy continues to expand, many Baby Boomers and adults in Generation X are finding themselves in a new role: caregiver. “Statistically, one in two adults is a caregiver for a loved one or family member,” said Amy Magan, Communications Manager in the Center for Aging & Community and College of Health Sciences. Magan sees a need for support often. 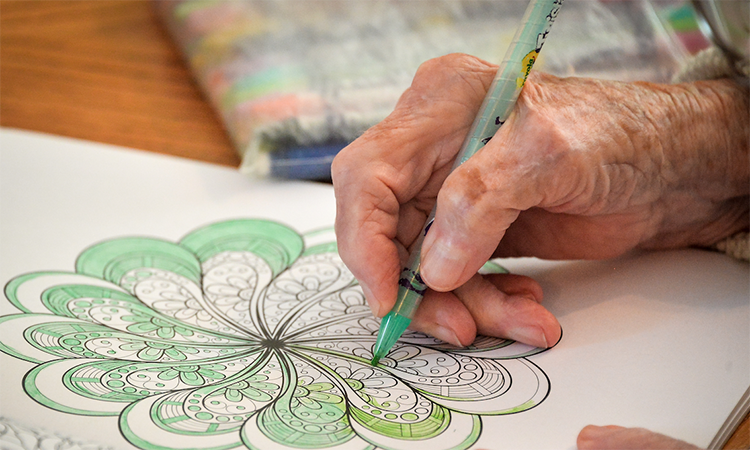 Regardless of the specific situation, human nature is based on connectedness, and adults caring for loved ones are building community at UIndy through the Caregiver Resource Group. The CRG meets on campus on the first Wednesday of every month. The format varies and sometimes includes a guest speaker or a facilitated discussion on a particular topic. Open to UIndy faculty, staff, and students, this group is organized by CAC and facilitated by Joy’s House, a local adult day center, which has a location behind the Health Pavilion. “Most of the work done by CAC is focused on external customers,” Magan said. “We decided this would be a way to make an impact on our own campus.” Working in collaboration with Candace Preston, the director of caregiver support services at Joy’s House, they launched the group meetings on a six-month trial basis. At Joy’s House, Preston uses her passion to help caregivers feel supported and encouraged by facilitating community caregiver groups, including the UIndy CRG. Dorella Phipps, who works in University Advancement, has been part of the group since the first meeting in July 2018. At the time, she was volunteering at Joy’s House and taking a Liberal Studies capstone class to complete her bachelor’s degree. She came to CRG as an academic exercise. The connections made during these monthly meetings has propelled the group’s longevity past the six-month trial. The next step will be to apply for Affinity Group status with the Office of Inclusion and Diversity. The UIndy Caregiver Resource Group meets on the first Wednesday of each month from noon to 1 pm in the President’s Dining Room. Attendees are welcome to bring their lunch. CAC provides drinks and dessert. For more information, contact Amy Magan at amagan@uindy.edu.